Luxury charter megayacht LAUREN L at 296 feet is one of the world's largest yachts available for charter. This magnificent yacht was built at Cassens Werft, Emden, Germany to the highest commercial standards of safety and comfort. Accommodations for 40 guests are in one king and 19 queen bed staterooms with a crew of 32 to attend to every need. Elegant crewed superyacht LAUREN L features four decks with a guest area of 1,800 sq metres with enormous open entertaining areas and small intimate areas for private discussions, a superbly equipped conference room and a vast array of leisure equipment. Throughout the day guests can relax on the sundeck or enjoy the luxurious health and beauty centre, which includes a sauna, steam room, aromatherapy treatment room, beauty and hair salon, gym and a relaxing observation saloon with spectacular views front and starboard. A fully supervised nursery is available throughout the day. LAUREN L has a large saloon with a large bar and deck areas for entertaining where you can hold a pre-conference drinks evening for your delegates or escape for a quiet chat in the library. 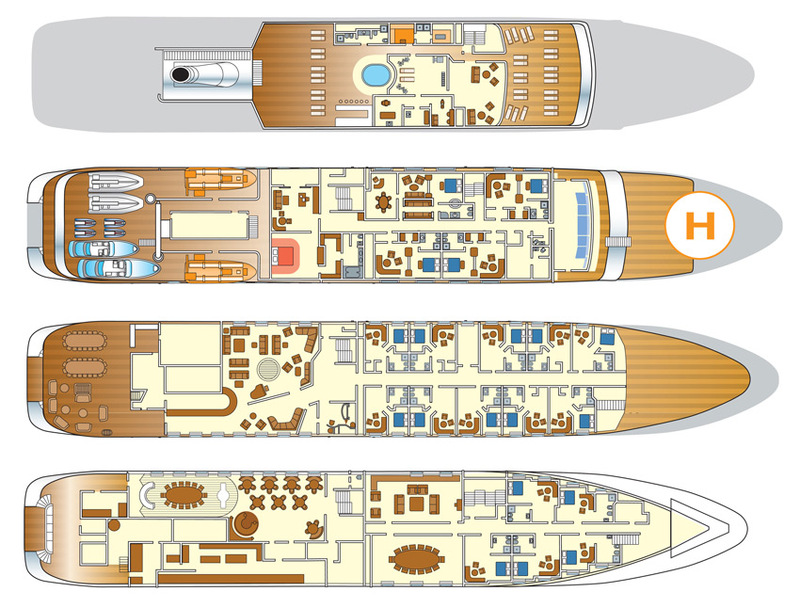 The main deck provides one of the yacht’s largest entertaining spaces. A casual aft deck seating area leads to a bar and a vast main saloon, with a grand piano. Mirrored ceilings, hand woven carpets and silk upholstery provide an atmosphere of comfortable elegance. When it’s time for work, the spacious conference room with large oval table and supremely comfortable hide chairs provides the perfect business environment. A fully integrated multimedia system with 50” plasma screen is set up for Internet access, video conferencing and presentations. The library is set up for less formal presentations or as a cinema with over 600 films and 10,000 music CD’s as well as satellite television. Internet and email workstations are linked up to the yacht’s broadband system. Forty guests are accomodated in 20 suites. The Master Suite on the Bridge Deck is 110 sq metres (1183 sq feet) and includes it own private balcony. The luxurious accomodation features a superior California king-size bed, plasma television and DVD equipment. The white marble ensuite bathroom features a double bath jacuzzi, a shower room and separate basins. WC and bidet. The suite has a subsidiary private saloon with a fully equiped study which leads on to the private balcony. A personal laptop with broadband internet access is provided. Other accomodation includes one double VIP suite of 60 sq metres, three double suites on the bridge deck, ten double suites on the upper deck and five double suites on the main deck. All have ensuite bathrooms, large wardrobes and Italian linens. Additionally, all suites have a mini bar, safe, direct dial telephones and plasma screens in both the bedroom and private saloon, linked to the large central film library. LAUREN L is the perfect private yacht for a spectacular family vacation, a corporate meeting, or a perfect conference venue. LAUREN L is available for winter charters in South-East Asia and the Indian Ocean based in Thailand. Summer charters are available in Mediterranean ports of call.